Have You Welcomed the Lord Jesus' Return? Since I believed in the Lord, in order to welcome the Lord Jesus’ return and be raptured to the kingdom of heaven, I have been passionate, preaching the gospel, sustaining the weak brothers and sisters and so on. However, although many years passed, I didn’t see the Lord come to rapture us into the kingdom of heaven. Instead, the faith and love of brothers and sisters in the church were getting colder and colder. In 2002, I suddenly heard that the Lord has already come back to take true believers in Him into the kingdom of heaven. Right then, I had an immediate thought: It’s impossible. The Lord Jesus should come upon a cloud. Afterward, I inquired the brothers and sisters in varying churches about the news that the Lord has come back. They all shook their heads, saying, “That’s impossible. The Lord will come back with a cloud. We all haven’t seen it yet. So, He hasn’t come back.” So I was even more certain that the Lord should come back with a cloud. I could not accept it if the Lord has not come back on a cloud. Having listened to the story, I laughed at the two stupid sons for recognizing their father according to the clothes. Meanwhile, I couldn’t help reflecting whether I was as foolish as the two sons with regard to the news of the Lord’s coming. I only judge the Lord’s return in accordance with whether He has come upon a white cloud. If not so, it is not the return of the Lord Jesus. I am the same as the Pharisees who waited for the Messiah, recorded in the Bible. They all knew that an infant boy would be born as their Lord. It was because the Lord Jesus’ work did not conform to their own notions and imaginations that they nailed Him to the cross and thus they were subjected to overwhelming disaster. At that thought, I quickly found out the book that brothers and sisters left for me and read those God’s words, “For several thousand years, man has longed to be able to witness the arrival of the Savior. Man has longed to behold Jesus the Savior on a white cloud as He descends, in person, among those who have pined and yearned for Him for thousands of years. Man has longed for the Savior to return and be reunited with the people, that is, for Jesus the Savior to come back to the people from whom He has been apart for thousands of years. And man hopes that He will once again carry out the work of redemption that He did among the Jews, will be compassionate and loving toward man, will forgive the sins of man, bear the sins of man, and even bear all of man’s transgressions and deliver man from sin. … Since Jesus departed, the disciples who followed Him, and all of the saints who were saved thanks to His name, have been desperately pining for Him and awaiting Him. All those who were saved by the grace of Jesus Christ during the Age of Grace have been longing for that joyful day during the last days, when Jesus the Savior arrives on a white cloud and appears among man. … Yet Jesus the Savior did not do this; He did the opposite of what man conceived. He did not arrive among those who had yearned for His return, and did not appear to all men while riding upon the white cloud. He has already arrived, but man does not know Him, and remains ignorant of His arrival. Man is only aimlessly awaiting Him, unaware that He has already descended upon a white cloud (the cloud which is His Spirit, His words, and His entire disposition and all that He is), and is now among a group of overcomers that He will make during the last days” (“The Savior Has Already Returned Upon a ‘White Cloud’”). Reading these words, I felt so excited in my heart. Actually, God’s words are clearly spoken. God has plainly told us that the white cloud means His Spirit, His words, and His entire disposition and all that He is. However, I, based on my own notions and imaginations, thought that the Lord Jesus would descend upon a white cloud. In this way, I clung to my erroneous notions: If the Lord Jesus arrives on a cloud I will accept. If not, I won’t accept. Today if I had not read God’s word, I would have delimited God’s work in my own notions and imaginations. Little do we know that the Lord Jesus has long ago arrived upon a white cloud and done His new work. Our notions and imaginations differ considerably from the work that God wants to do practically. God does His work according to His principles and His own plan instead of our imaginations. At that moment, my heart became much more enlightened. Then, I read another passage of God’s words, “God makes His own choices and has His own plans when He does His work; moreover, He has His own objectives, and His own methods. It is not necessary for Him to discuss the work He does with man or to seek the advice of man, much less notify each and every person of His work. This is the disposition of God and, moreover, should be recognized by everyone. If you desire to witness the appearance of God, if you wish to follow the footprints of God, then you must first transcend your own conceptions. You must not demand that God do this or that, much less should you place Him within your own confines and limit Him to your own conceptions. Instead, you should ask how you should seek the footprints of God, how you should accept the appearance of God, and how you should submit to the new work of God; that is what should be done by man. Since man is not the truth, and is not possessed of the truth, man should seek, accept, and obey” (“The Appearance of God Has Brought a New Age”). Those words made me feel doubly rebuked in my heart. As for the news of the Lord’s coming, I required God to do this or to do that, which is too unreasonable! I thought back that I had been expecting the Lord for many years. When someone testified to me that the Lord has already come back, I lived in my notions, neither seeking nor investigating, but refusing the Lord’s return. What difference is there between my behaviors and the Pharisees’ resistance against God when believing in God? From this, we can see that faced with the Lord’s return, we should seek, obey, and accept it. If we always hold on to our conceptions, we will repeat the way of the Pharisees. In the end, we will offend God’s disposition because of our resistance against God. Just as God says, “Many people may not care what I say, but I still want to tell every so-called saint who follows Jesus that, when you see Jesus descend from the heaven upon a white cloud with your own eyes, this will be the public appearance of the sun of righteousness. Perhaps that will be a time of great excitement for you, yet you should know that the time when you witness Jesus descend from the heaven is also the time when you go down to hell to be punished. It will herald the end of God’s management plan, and will be when God rewards the good and punishes the wicked. For the judgment of God will have ended before man sees signs, when there is only the expression of truth” (“When You Behold the Spiritual Body of Jesus Will Be When God Has Made Anew Heaven and Earth”). God is merciful to us humans as well as wrathful. During the period when God works in the flesh secretly, God does all He can to save man. When God’s work in the flesh concludes is when God unleashes His wrath. Today the Lord Jesus has again returned to flesh to do His work so as to save man. If I cleave to my notions, not accepting Almighty God’s work in the last days, I will have lost God’s salvation in the last days. It will be too late for regret then. Thank Almighty God for His grace and mercy to me. If God hadn’t arranged for brothers and sisters to preach the gospel to me, I would not have had the chance to meet the return of the Lord. 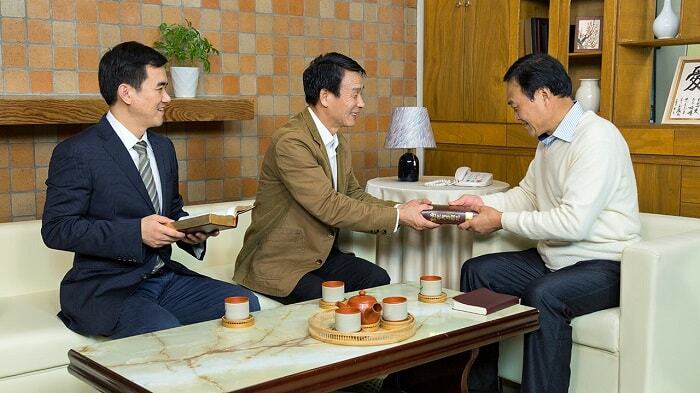 Only after I accept the work of Almighty God in the last days and come to God’s house do I know that Almighty God’s gospel of the kingdom has been spread to the countries all over the world. All kinds of books, and videos including movies, choirs and MVs have been uploaded to all different platforms. God is still giving us this rare and fleeting opportunity, waiting for us to return before Him soon. Now God’s work will come to an end. Have you welcomed the Lord’s second coming? By Mu Xue One day, I read a short story: After a shipwreck, the sole survivor drifted toward an uninhabited island. Day after day he sincerely prayed to God to save him out of this place so that he could return to his hometown. But there was nothing except a.. The story of ore and fire tells us that trials and refinements are meticulously arranged by God on our path of believing in Him.